Deciding on which position you should really focus your attention on when playing daily fantasy basketball is a tough. 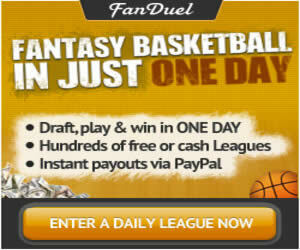 There are so many different ways that players can use their strategies for their daily fantasy basketball lineup. Today we are going to take a look at which of the positions is the most important one when choosing your roster for the day in order to make you money playing at a DFS basketball site like FanDuel.com. Obviously you'll find that for most online daily fantasy basketball sites, the way that the lineups will typically work is that you will need to choose at least two point guards, two shooting guards, two power forwards, two shooting forwards, a center, and occasionally a utility player also. The best way to look at this is that whichever position you feel is the most important, is the one that you should invest most of your salary cap dollars on, (unless there is a big time sleeper), and is also the one that you should use as your utility or flex position. So Which Fantasy Basketball Position Should You Spend On? For me, I'd say that it comes down to which guys are going to have the ball in their hands throughout the entire game. You can probably already guess that this is the point guard. 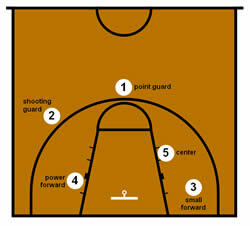 The point guard runs the offense; they have the best chance to score, get assists, get steals, and much more. Also you'll find that a key point guard is going to get a ton of minutes also, whereas a shooting guard who is struggling from the field in a game could end up losing minutes to a bench player if things don't work out in that specific game leaving you in a tough spot. I also make sure to focus on having a stud point guard with a good matchup if possible. The best thing to look for when searching through the point guards is who will be guarding them on the other side of the ball that night as well as which NBA teams have given up the most points to point guards throughout the NBA season (fantasy points that is). If you can find 2-3 point guards to build your lineup around that aren't going to break the bank and have great matchups, then you are obviously in an excellent situation. These players don't always have to be on the best teams though, and often the best way to find a top point guard is to find one who may end up needing to dominate the game for his team to win when all is said and done. Finding a point guard who has the potential to dominate a game means that you could see a 30, 40, or 50 point scorer, and a player who will get your team headed in the right direction from the word go. Also, when looking at the different options for fantasy point guards in your daily fantasy basketball lineup, look at their averages and how they've done against the specific team that they are matched up against that night, as this can give you a great angle for adding them. More often than not, you aren't going to want to pencil in a point guard who is playing a team that double-teamed him consistently in their last game, or found a way to slow him down. Once again it comes down to doing your homework and researching previous game results and stats in order to find the best players (in this case point guards) to fill out your daily fantasy basketball roster. Use the Point guards to win cash! Choosing top point guards first and then filling out the rest your roster is one of the key strategies to winning daily fantasy basketball contests at top sites like FanDuel.